For years, when discussing high field-strength electromagnetic compatibility (EMC) radiated susceptibility testing, Traveling Wave Tube Amplifier (TWTA) technology has been the only available option for pulsed field generation. Now, there is a very attractive alternative to this technology. AR RF/Microwave Instrumentation is now offering high-power Solid State pulsed amplifiers. These SP-series amplifiers include various frequency ranges and output power levels to meet several standards. Additionally, designs can be tailored to suit your specific application. This article will discuss some of the key features and benefits of AR’s new line of Solid State pulsed amplifiers. Additionally, to better measure the forward and reverse powers of these SP-series amplifiers, AR is also introducing a new line of USB peak power sensors. These PSP-series probes offer high speed and accurate peak RF power measurement capabilities that are ideal for EMC testing, manufacturing testing/troubleshooting, amplifier design/development, and research. These devices can be used in both commercial and military applications such as telecommunications (LTE-TDD/FDD), avionics, RADAR, and medical systems. They are the instrument of choice for fast, accurate and highly reliable RF and microwave power measurements. Inherent to the nature of TWTA technology, there are a number of characteristics that are undesirable for EMC applications, one of which is harmonic distortion. TWTAs are rich in harmonic content. 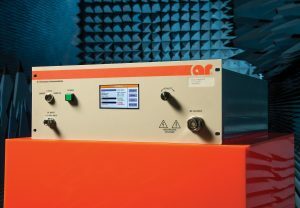 While many consider this to be a benefit in the world of audio amplification, the opposite is true of RF amplifiers in EMC testing applications. When producing an electric field for EMC testing, harmonics lead to an inaccurate representation of the intended field. Many EMC specifications go as far as requiring that harmonics be below a certain threshold. Oftentimes, TWTAs have difficulty meeting these requirements. This is not the case with Solid State amplifier technology. AR’s new SP-series are specified with typical harmonic content of -18 dBc or better at P1dB. To achieve this same kind of harmonic performance with TWTAs, typically large, expensive filters must be placed on the output of the amplifier. Not only does this add cost and physical size to the TWTA, it also can create an impedance mismatch at the output of the amplifier, thus requiring more output power, or causing amplifier shut-down. Additionally, the SP-series has a much higher compression point than itsTWTA counterparts, thus allowing for a wide range of linear gain. Another extremely important feature of RF amplifiers is mismatch tolerance. 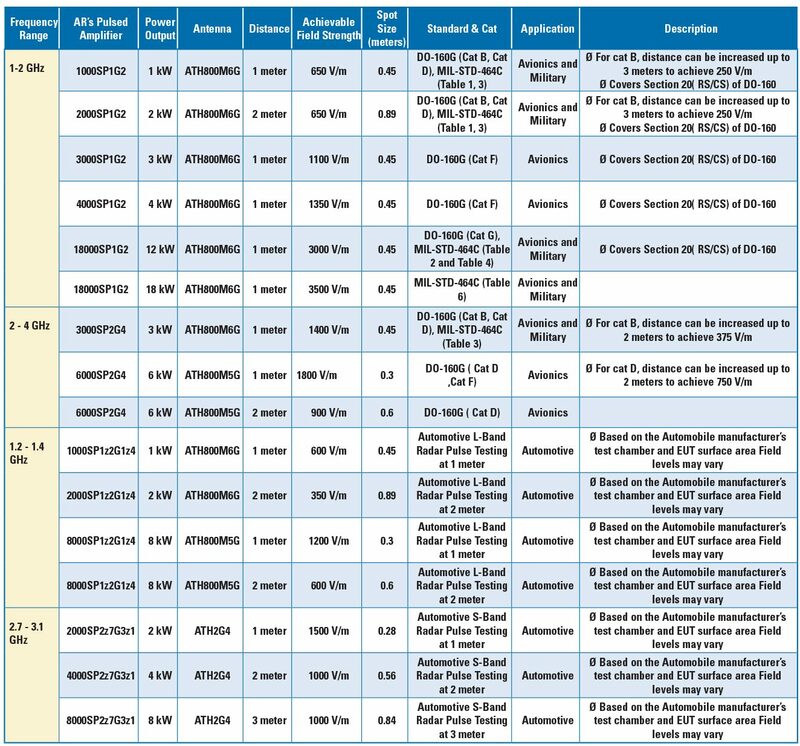 In EMC applications, there are an abundance of available antennas for use in field generation. While this provides a lot of options for frequency range, gain, power handling and so on, this can lead to significant variances in the antennas’ voltage standing wave ratio (VSWR), meaning that the impedance of the antenna can vary greatly from an ideal 50Ω, thus causing reflected RF power. While antennas most often used in the frequency range in question typically have a relatively stable VSWR, this, along with chamber loading and large EUTs (common for high field strength applications), can be a serious issue for TWTAs. Generally, TWTAs have a poor mismatch tolerance and will begin to fold back or even shut off for a relatively small VSWR. Solid-State amps, on the other hand, tend to have a much higher mismatch tolerance than TWTAs. For example, AR’s SP series amps will not begin to fold back until the reflected power reaches half that of the rated output power. Better still, Solid State technology does not exhibit the parasitic oscillations that occur in TWTAs. Solid State amplifiers also have a much higher reliability than TWTAs. Tube technology suffers from numerous deficiencies in reliability, including repeatability in production, parts availability and the decreasing number of tube manufacturers throughout the world. Even with improvements to TWTA manufacturing processes, performance of the TWTAs can dwindle when left in standby or sitting unpowered on the shelf. If a TWTA does not have any planned use, it is necessary that the user periodically run the amp to prevent degradation of the tube. These Solid State pulsed amplifiers also have a much lower noise figure (NF) than their TWTA counterparts. In addition to the above advantages, the warranty for these AR solid state amplifiers is 3 years and repairs are much easier to accomplish, and can be completed during a much shorter time frame. Other characteristics of SP amplifiers include pulse widths up to 100+ µsec, duty cycles up to 10%, a front panel digital display providing forward and reflected power as well as system and transistor status, IEEE-488 and Ethernet interfaces, and forced air and water cooling options. AR’s new line of Solid State pulsed amplifiers are designed for a variety of frequency bands between 1 and 4 GHz. These bands primarily line up with automotive, aviation and military standards. Particularly, these frequency bands cover L- and S-band radar pulse testing as required by automotive standards, as well as various high-power offerings for specific octave frequencies from 1–2 GHz and 2–4 GHz as required by MIL-STD-464 and DO-160, as well as full vehicle automotive testing. 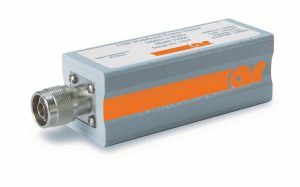 Within these frequency bands, a number of standard output power options from 1 kW to 20 kW are available. Paired with the appropriate antenna, these amps can generate a wide range of field strengths at a wide array of antenna distances. Additionally, AR has the capability to build custom amplifiers up to 150,000 watts depending upon frequency and pulse conditions. As previously described, the SP series amplifiers have been designed for a number of different applications. Pairing AR’s new Solid State pulsed amps can provide you with a wide range of field strengths. Table 1 gives example field strength levels when using various SP-series amplifiers and AR high-gain horn antennas. This table assumes reasonable losses. As has been an industry norm, average power sensing is a useful tool in measuring the output of typical Continuous Wave (CW) output amplifiers. However, in order to properly measure the output of a pulsed amplifier, it is necessary to use peak power sensing, rather than average power sensing. AR RF/Microwave Instrumentation once again sets the standard with the introduction of its fast RF power measuring PSP series wideband USB pulse power sensors. Built with Real-Time Power Processing ™ technology, this new product line offers the high speed and accuracy that customers demand. These meters are ideal for measuring the pulsed output of our SP-series amplifiers as they can easily and reliably measure the exact output pulse characteristics. 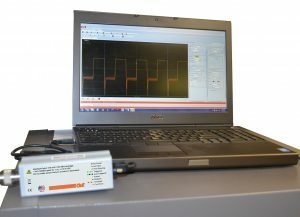 The USB Pulse Power Sensor functions as an ultra-fast, calibrated power measurement tool which acquires and computes the instantaneous, average and peak RF power of a wideband modulated RF signal. An internal A/D converter operates at up to 100 MSamples/second, and a digital signal processor carries out the work required to form the digital samples into a correctly scaled and calibrated trace on the display. Figure 2 shows a block diagram of the peak power sensor. The first and most critical component of a peak power sensor is the detector, which removes the RF carrier signal and outputs the amplitude of the modulating signal. The video detector’s bandwidth dictates the sensor’s ability to track the power envelope of the RF signal. Figure 5 shows how a detector with insufficient bandwidth is unable to faithfully track the signal’s envelope, therefore affecting the accuracy of the power measurement. In contrast, the detector on the right has sufficient video bandwidth in order to track the envelope accurately. It is possible for the detector to track very fast amplitude changes due to modulation by optimizing the sensor’s response time. The video bandwidth of the sensor must be at least as wide as the signal’s modulation bandwidth in order to be able to accurately track it. The PSP001 provides an industry leading video bandwidth of 195 MHz for spread-spectrum signals, and measures rise times as fast as 3ns. It has a sample rate of 100 MHz, enabling the analysis of both very short bursts and very broadband signals, as well as power versus time waveforms in very high resolution. Real Time Power Processing (RTPP) is a new signal processing technology which is a key factor in ensuring the accuracy of measurements. This advanced technique enables the sensors to constantly collect samples without any gaps in their acquisition, ensuring that no data is lost. The conventional method involves collecting samples until the sensor’s buffer is full, at which point acquisition stops until the collected samples are processed. RTPP collects and processes samples so quickly that the buffer is never filled. In order to create a trace on the screen, conventional meters and USB sensors carry out the required steps in sequence, which therefore means that processing can take as long as tens or hundreds of milliseconds. Real Time Power Processing performs many of these steps in parallel and at full acquisition rate, so it is not necessary to halt acquisition following a trigger event to wait for the processing stages to catch up. To date, pulsed high-power RF amplifier performance from 1–4 GHz has been dominated by low Mean Time Between Failure (MTBF) TWTAs, but AR’s new Solid State pulse amplifier designs offer better performance and reliability, and are backed by the AR brand with a 3-year warranty. These amplifiers provide an attractive alternative to TWTA solutions. If you would like to learn more, feel free to contact one of our applications engineers at 800-933-8181 or visit our website at www.arworld.us.